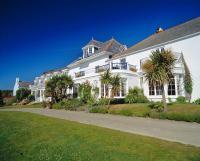 Perelle Bay Hotel is situated on the beautiful rural West coast of Guernsey in St Saviour and overlooks Perelle Bay. At the front of the property there is a decked sun terrace overlooking the beach and there are attractive gardens and a swimming pool at the rear of the hotel. Many bedrooms have sea views across the bay. Guests enjoy a traditional menu in gold award-winning bar. Families are welcome.